Don’t miss this exciting opportunity to learn the dynamic fundamentals of inversions and handstands with internationally renowned inversions teacher, Dan Morgan. We are incredibly lucky to have Dan join us at Oceanflow Yoga on his latest international tour and welcome him on his first ever visit to Cornwall. All levels welcome – lots of options will be offered, and therefore all will be made accessible. This will also allow you to understand how you may progress. Each segment is £35. If booking 2 segments together on the same day, we are offering the special price of £60 and £120 if you book all 4 segments. This workshop explores the necessary flexibility (mental and physical) required when approaching and achieving a competent inversion practice. 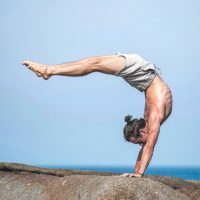 The aim of this workshop is to bring a deeper understanding of how can achieve the required mobility to align our bodies whilst upside down, & how we find stability in our inversions practice. Through practical experience and various drills, this workshop aims to get you feeling more mobile, and to help you understand how to find that sweet spot to balance with more ease! This workshop looks at how we find ease & finesse in our inversion practice. The aim of this workshop is to bring everything together from the previous three workshops – and then to experiment with taking it all a step further. After we begin to understand the practice of inversions – we can then begin to incorporate them into all sorts of fun vinyasa sequences, and more dynamic practices. This workshop offers various drills to help us on our journey to understanding how we can float and press into our inversions with control & ease!